Over the past 40 years Cambodia’s cultural heritage has been looted on a massive scale, with countless thousands of artifacts taken from hundreds of sites, smuggled out of the country and into museums and private collections around the world. New research indicates that not only was much of this the work of organized networks, but that most pieces have disappeared from public view - probably forever. Between the start of Cambodia’s civil war in 1970 and the eventual end of hostilities some 30 years later, the country’s 1,000-year-old temples and other historic sites were comprehensively plundered. In one incident in the early 1970s, government soldiers used a military helicopter to airlift artifacts from the 12th century citadel of Banteay Chhmar in the northwest. At the same complex in 1998 - generals spent a fortnight tearing down and carting away 30 tons of the building. Just one of the six military trucks that went to neighboring Thailand loaded with artifacts was stopped and its contents returned. The rest disappeared, likely sold on the black market. For many years, researchers assumed that such brazen, well-organized looting was the exception rather than the norm, and that most of the looting of Cambodia’s heritage was a low-level affair, with local people plundering ancient sites and selling statues, carvings and stone reliefs in haphazard fashion. But a new study carried out by researchers from the University of Glasgow in Scotland shows that was not the case. “The organized looting and trafficking of Cambodian antiquities was tied very closely to the Cambodian civil war and to organized crime in the country," explained Tess Davis, a lawyer and archaeologist, and member of the study team that also included criminologists. "It began with the war, but it long outlived it, and was actually a very complicated operation, a very organized operation, that brought antiquities directly from looted sites here in the country to the very top collectors, museums and auction houses in the world," she added. Davis said the Cambodian and Thai militaries were often involved in looting, as was organized crime. Local people were often forced to work as laborers. Researchers say that at the end of the chain in Thailand was a Bangkok-based dealer who provided the laundering link between the criminals and the collectors and museums. The University of Glasgow study is a key part of international efforts to try to improve understanding of how the market for stolen antiquities operates. 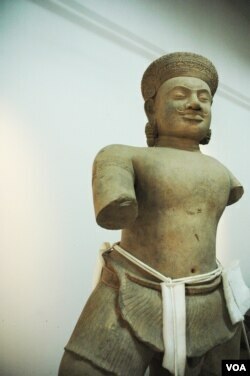 It is the first to show how artifacts travel the full distance from ancient sites to the hands of art collectors. Grim though the destruction of Cambodia’s cultural heritage is, there are occasional victories. Earlier this month Cambodia welcomed back three life-sized statues that had been looted in the 1970s from the Koh Ker temple complex where they had stood undisturbed for more than 1,000 years. Two other statues in that group were returned last year by New York’s Metropolitan Museum of Art. In a restoration room at the National Museum of Cambodia in Phnom Penh, specialists are working to ready the five statues for display later this year. Museum director Kong Vireak said authorities are taking new steps to protect culturally important artifacts from looting. That includes documenting all items in the museums and those at unprotected sites - including, in a country where ancient objects are often venerated - artifacts that people worship. “But in the case that those objects are worshipped by local people, by villagers, we will keep in place, but we make a special form that villagers or community who own that object - also provincial authority, district authority - have to sign on the document that they have to protect those statues from looting. Otherwise we have to transfer to storage in the provincial museum,” stated Vireak. The huge value that artifacts command mean museums and ancient sites are often among the first casualties of war - as Iraq, Egypt and Syria have experienced in recent years. In some cases, the money generated gets spent on arms, furthering the cycle of war and the misery of the civilian population. Tess Davis said that fact alone ought to wake up the world to the bigger picture: that the looting and trafficking of antiquities is often the work of organized crime and armed factions. “And that link should be a red flag for the world today because we are seeing the same thing repeated today in Egypt and Syria and Iraq, and with very serious consequences - not just for those countries but also again for the world economy and for global security. The money that collectors in New York are spending on antiquities from around the world is going into the pockets of some very bad people - and I think the art world needs to step up and recognize their role in what’s happening in these countries,” said Davis. In Cambodia’s case, the worst of the looting has now ceased - in part because there is little left to take. But the coming years will see more sites discovered, and it is likely that they will be in danger too. The best way to protect ancient sites, says Davis, is to reduce demand and that in part requires prosecuting those who carry on the trade.